The Software Shrink | Research, theories and techniques to real-world problems, questions and issues in software. 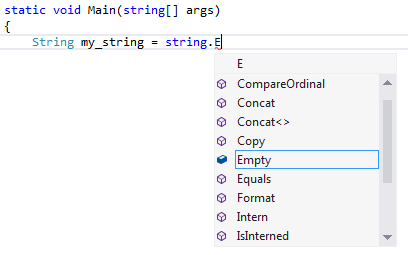 Occasionally, I’ve been caught where Visual Studio’s intellisense just seems not to work /correctly/. It shows a list of the possible options but then pressing enter, dot, or semi-column doesn’t auto-complete the word, e.g. 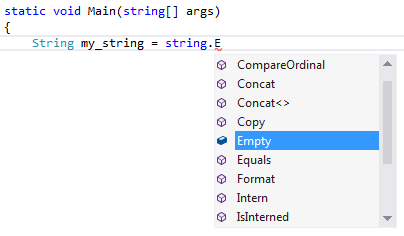 In suggestion mode, intellisense only shows a list of possible values, and it’s up to the user to manually select the item with the arrow keys and then press enter, dot, tab etc.The tell here is that the word is not automatically highlighted. Great – now that we know what mode we’re in – how do I change it? To switch between intellisense modes, press CTRL-ALT-SPACEBAR, or Edit/IntelliSense/Toggle Completion Mode. None of these techniques has worked for every scenario. Through trial and error, I stumbled across a technique that is simple to implement and doesn’t place constrains on the design layout (can use absolute coordinates). It all comes down to understanding a bug that currently exists in the .Net 4 winforms framework. If the Form’s ControlBox is set to false in the designer for a fixed single dialogue, it incorrectly lays out the dialogue for a variable DPI scenario. The form’s title bar is not taken into account when determining the size of the form to be shown, so it is drawn slightly too short in height. There is a simple work around to this problem. In the designer, leave the Form’s ControlBox value as true, and in the Form’s Load event, set the ControlBox to false. /// Event handler for the form's Load event. // to be shown, so it is drawn slightly too short in height. // here in the Load event. Nullable value types are often required when working with event handlers that use the vanilla object class for parameter passing. e.g. This is quite a long winded process for determining the parameter that was passed into the function. There’s got to be a better way… and there is! With the help of “? ? ?”, the above code can be written cleanly in one line. There are times in code when you if available, enum polymorphism would be great. To help explain what I mean by this, consider the following scenerio. Let’s define a simple library that allows a client to read and write strings to addresses. Some of these addresses are read only, whilst others may be both read and written. // A user-defined name (read and write). Then a client can use this library as shown below. // BAD - run-time error! This program will compile successfully, but will fail at run-time (when we attempt to write to the SerialNumber address). Instead, it would be better if we could force the compiler to help us find these errors. For this simple scenerio, a simple code review may have discovered the error. But as the code expands, or other clients use the library, the error may not be so easily detected. The question is, is it possible to design a better library to help the client discover these errors at run-time? This library now ensures that only addresses that are AddressWrite can be written to; and both the AddressRead and AddressWrite can be read. Currently, the C-Sharp language does not support this concept of enum polymorphism… but let’s not let that stop us. This code can be easily changed to work within the constraints of the C-Sharp language, and provide the compile-time support we endevour to seek. Below is the new library written using classes to define the types of available addresses; and a static class to hold all the enumerations. The code will now correctly fail at compile time. There are times when you may want to display a MessageBox and after X seconds, if a user has not closed the message box, automatically close it. Below is a simple example of how this may be achieved by creating a thread that runs an anonymous method. This anonymous method can directly access the outer-scope variables, in particular the EventWaitHandle used for signalling. The end result is a simple static method. NOTE: There are many examples on the web for how this may be achieved, but nearly all of them require a class to hold state information. /// Displays a MessageBox to the user. // after a period of time if a user hasn't clicked it. // Wait to be signalled that the MessageBox is closed. // User failed to click okay - attempt to auto-close dialogue. // Start the auto-close thread. // Show the error message box. // Notify the auto-close thread that we have shut-down the MessageBox. This can be easily extended to match all the MessageBox.Show signatures. For completeness, the Native methods are shown below. /// Wrapper class for the native method calls. /// match the specified strings. This function does not search child windows. /// This function does not perform a case-sensitive search..
/// Sends the specified message to a window or windows. Win-Forms data-binding is done via a String parameter which specifies the member name to be bound, e.g. // Create a TextBox and a Person. // Bind the age of that person to the textbox's text property. If a member name is changed (either manually or F2 – e.g), more often than not, the data-binding that is bound to that member will not be updated, the program will compile successfully, and the problem will not be found until run-time (hopefully found before the product is shipped). e.g. If we rename the Age property of the Person to AgeInYears, this program will compile successfully, but will fail at run-time. Instead, it would be better if we could force the compiler to help us find these errors. // Instead of doing this. // I would like to do this instead. With the aid of the PropertyNameHelper.GetPropertyName, we could do this with the following code. /// Returns a <c>BindingTarget</c> which can be used to bind a data source to a control. // Simply return the binding target. /// Class that represents a control and property of the control, for data binding purposes. /// Creates a new <c>BindingTarget</c> instance. // Store away the control to be bound and the property name. /// Binds the <c>ControlToBind</c> to the data member of the specified data source. // Extract the name of the data member, (field or property), of the data source, from the expression. // Bind the control to be bound, to the data member of the data source. /// The control to be bound to a data source. /// The property name of the <c>ControlToBind</c> to bind the data source to. /// Helper class to assist in getting the string names of properties and fields from a given class. /// Gets the name of the property represented by the expression for the given type. // Get the body part of the passed-in expression. // Check if the body represents an expression accessing a class member. // of the member that the expression represents. // Check if the body represents a unary expression. // No operand was found, so return an empty string. // The operand contains the name of the member in the expression. // Nothing found, so return an empty string. These days, it’s common practice to unit-test our code. Whether you’re a TDD, or simply doing white box / black box unit-testing post coding, the final act of having a unit test in place to test conformancy to certain requirements is good practice. But what requirements should we be testing? The common approach is to test the functionality of a unit of code, i.e. for a particular set of inputs, test for the expected output(s). This is good. But with OO based-design, and win-forms data-binding, I believe we need to go one step further. We need to test the public interface declaration – the classes contract to the outside world. We need to test that the public interface for both the getters and setters of a class do not change scope or name. Why do I say name? Win-Forms data-binding is done via a String parameter which specifies the member name to be bound. If a member name is changed (either manually or F2), more often than not, the data-binding that is bound to that member will not be updated, the program will compile successfully, and the problem will not be found until run-time (hopefully found before the product is shipped). /// Creates an instance of the <c>PropertyTester</c> class. /// confirm that all properties were tested. // Create a list of all the properties expected to be tested. /// Checks that the property getters and setters accessors for an object are as expected. // Confirm that the getters and setters for the property are correct. // Get a handle to the Property of the interested target. // If the test code fails here, then a Property name has changed on the target. // It is important that ALL GUI code that refers to this Property name is updated. // as the ObjectListView class uses reflection for setting/getting values. // Confirm the existance of the public getter. // Confirm the existance of the public setter. // Remove properties with this name from the targetPropertyList list. /// Confirms that all property checker/getters were tested on the target. // still contains objects, then this means some properties were not correctly tested. /// The target object to be tested. /// The list of properties for the target expected to be tested. /// Whether a failure has been detected or not. /// Tests the properties getters and setters access to the Person Class. // Create a PropertyTester to facilitate the testing of the getters/setters. // Check the expected access to each property.